People talking and sharing food at an Opioid Dialogues event in Duncan. Dialogue is a method of communication that involves two-way conversation in which people not only speak but also really listen to one another. This kind of listening involves empathy. Each partner in a dialogue is curious about the experiences of the other partners – about their assumptions, beliefs and values. The goal is to leave the conversation with a better understanding. Using dialogue to address the opioid crisis means far more than simply talking about drugs. After all, addiction is not simply about drugs but results from a breakdown in the fabric or connectedness of human community. Dialogue needs to help us understand each other and build social relationships that support individual needs, preferences and autonomy. The breakdown of this integration of the community and all its members is at the root of addiction. Dialogue is an important tool in re-building this integration. Apply for an Opioid Dialogue grant. A police officer and a parent sitting at the same table told each other stories about how the opioid crisis affected them. "Both parties got to share their sides and then they both admitted to how hard it must be to be on the other side of things." 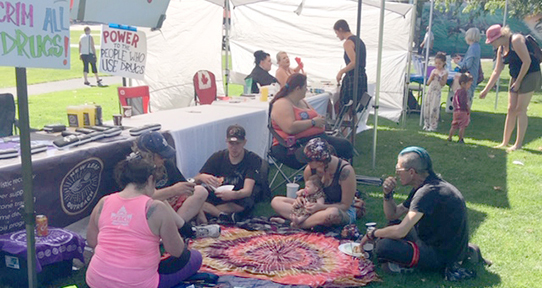 In a town of citizens "numbed" by the opioid problem, a coalition brought people with diverse views and backgrounds together through meal sharing and even poker games. “Dialogue is about a suspension of judgment that helps us to listen to each other. It’s about a new way of seeing each other." At the end of a large community dialogue, "the energy in the room of over 100 participants had shifted from ‘You need to do something about the needles’ to ‘What role can I play?'" See more in our Opioid Dialogues photo album. CISUR administers funds provided by the Ministry of Public Safety and Solicitor General as part of the province’s commitment under the Joint Task Force on Overdose Response to support community dialogues that will increase understanding and community capacity to act collectively in addressing the overdose crisis. Community coalitions are encouraged to apply for an Opioid Dialogue grant.